It isn't that Republicans are bad, but when they they disagree with Obama they are pissants. However, if you ARE Barack Obama, well you just might send a furrow up his leg. Much like how friends listen to Endless Love in the dark, impartial talking heads can get unbiased furrows up their legs. 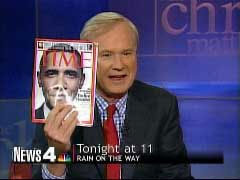 I Hate Chris Matthews, and so Should You. You know how people like add "East" or "West" to already existing places in order to describe newer places? Like someone may call Atlantic City, "Las Vegas East", or call Miami, "Rio de Janiero North"? I'd like to start the movement to call Chris Matthews, "Glenn Beck Left". However, if you'd prefer to call him, "Old Tingley Leg" instead, I'd also be ok with that. What a scrotum.